The New York State Breeding Bird Atlases show few records of this species - six blocks in 1980-1985 and four in 2000-2005, with the latter all in the northwestern region of NYS south of Lake Ontario. There are no historical records from Somerset & Yates. There are three eBird records in the Lake Ontario coastal region closer to Rochester, NY in the past decade. There is also a single record in 2012 from Iroquois NWR. None were detected in the 2016 nocturnal flight call survey in the northern portions of the Towns of Somerset & Yates. Five occurrences were detected from the 2017 survey from Stations 2, 3, 5 & 6. Audio examples: Station 2 (May 19, 2017); Station 3 (May 19, 2017); Station 3 (June 4 2017); Station 5 (May 22 2017). The New York State Breeding Bird Atlases indicate this species was present in the northern half of Orleans County in 1980-1985, but was barely detected there in the 2000-2005 effort. Since 2008, eBird contains only two sightings from this region - both at Golden Hill State Park in the Town of Somerset and both in the spring migration period (May 3, 2012 & May 23, 2017). The spring 2016 nocturnal flight call study detected the species in the migration period in the northern portions of the Towns of Somerset & Yates (Stations 1, 3, & 5). Preliminary analysis indicated detections from April 21 - May 10. Audio examples: Station 1 (Apr 29, 2016); Station 3 (Apr 26, 2016); Station 3 (May 10, 2016); Station 5 (Apr 21, 2016); Station 5 (Apr 25, 2016); Station 5 (Apr 26, 2016); Station 5 (May 9, 2016). The New York State Breeding Bird Atlases barely indicate any records for this species in Somerset & Yates, with one possible record from 1980-1985 and none in 2000-2005. Since 2008, and prior to that, there are no eBird records for Somerset & Yates. The spring 2016 nocturnal flight call study detected the species in the migration period in the northern portions of the Towns of Somerset & Yates (Stations 1, 2, 3, 4, 5, 6). Preliminary analysis indicated detections from May 4-28. Audio examples: Station 1 (May 4, 2016); Station 1 (May 22, 2016); Station 2 (May 18, 2016); Station 3 (May 10, 2016); Station 5 (May 4, 2016); Station 5 (May 28, 2016). Based on the New York State Breeding Bird Atlases, this species may have had a very small breeding presence in Somerset & Yates in the early 1980s, but there is no such evidence since then. Since 2008, there are six eBird reports of this species in Somerset and Yates, all in spring migration (May 19-30) and all in the vicinity of Golden Hill State Park. The spring 2016 nocturnal flight call study detected the species in the migration period in the northern portions of Somerset & Yates (Stations 1, 2, 3, 5, 6, 7). Preliminary analysis indicated detections from May 11-31. Audio examples: Station 1 (May 23, 2016); Station 1 (May 23, 2016); Station 1 (May 25, 2016); Station 1 (May 25, 2016); Station 1 (May 28, 2016); Station 1 (May 31, 2016), Station 2 (May 20, 2016); Station 2 (May 24, 2016); Station 2 (May 27, 2016); Station 2 (May 28, 2016); Station 3 (May 25, 2016); Station 3 (May 28, 2016); Station 5 (May 11, 2016); Station 5 (May 18, 2016); Station 5 (May 25, 2016); Station 5 (May 25, 2016); Station 5 (May 28, 2016); Station 6 (May 24, 2016); Station 7 (May 24, 2016). The New York State Breeding Bird Atlases have not indicated breeding of this species anywhere near Somerset and Yates. Like the Common Nighthawk, this species declined preciptiously across NY between the 1980-1985 Atlas and that from 2000-2005. It is likely spring migrants passing through Somerset and Yates are not NY breeders but are headed to Ontario, where steep population declines are also occurring. There are no eBird records of this species in Somerset or Yates, and very few in western NY since 2008. The spring 2016 nocturnal flight call study detected a single bird calling from the ground at Station 2 on May 10. Two individuals were recorded calling together Audio: Station 2 (May 10, 2016); Station 3 (May 16, 2017). The 2000-2005 New York State Breeding Bird Atlas indicated widespread decline of this species since 1980-1985, but still documented the species breeding in Somerset and Yates. Since 2013, there are more than six records in eBird during June & July in Somerset & Yates (suggestive of local breeding). The spring 2016 nocturnal flight call study began in mid-April after this species' primary spring migration period, and accordingly no nocturnal flight calls were recorded. At least two individuals of this species were recorded singing at dawn on many mornings in the fields proximal to station 5. Audio example: Station 5 (May 6, 2016). While the 2000-2005 New York State Breeding Bird Atlas showed substantial decline of this species from the 1980-1985 Atlas effort, the species still apparently had a small breeding presence in the northern portions of Niagara and Orleans Counties. Since 2017, eBird records support this with numerous June records from three sites in northern Yates. The spring 2016 nocturnal flight call study detected 282 calls of this species, 230 of which were separated from one another by at least a minute (i.e., likely different individuals). Calling detections were not uniform across stations in the transect and showed a concentration of calling activity at the coastal stations. Most calls were recorded from late April through the third week in May - these are presumed to migrant birds largely headed toward the Province of Ontario, where steep population declines are also occuring. 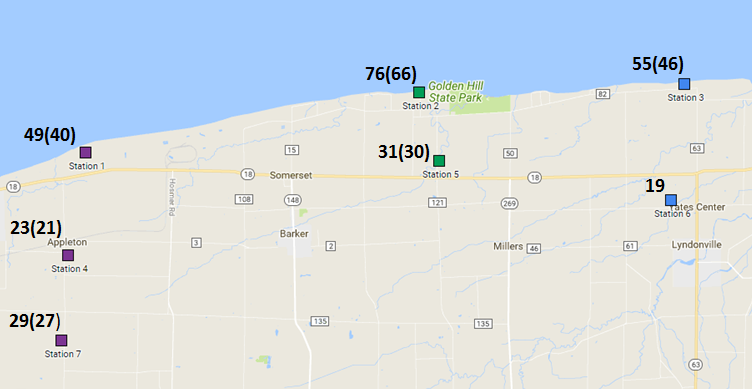 Stations 1, 2, & 3 each had a few Grasshopper Sparrow nocturnal flight call detections after June 10, suggesting local breeders flying about, and Station 6 had two calls in early June, which also may have been from local breeders. This species is especial prone to flying about at night in the vicinity of their breeding grounds. Audio example: Station 2 (May 3, 2016). Additional 2016 audio records (with spectrograms) are in the Vesper call archive. Number of Grasshopper Sparrow nocturnal flight calls (number of calls separated by at least a minute from one another) documented in spring 2016. The 1980-1985 New York State Breeding Bird Atlas showed a few scattered breeding records in the northern portions of Niagara & Orleans Counties. The 2000-2005 effort showed huge declines across all of NY and just a few records for Niagara & Orleans along their southern borders. A record in eBird from the Town of Somerset (Orleans County) north of route 18 in 1999, and two eBird reports from coastal Orleans County in 2009 suggest the species may still be present in the region in small numbers. The spring 2016 nocturnal flight call study logged one call of this species just after midnight on May 12 at Station 6. This is about 10 km ESE of the site of the 1999 eBird site. There is currently a fair amount of habitat for the species in northern Somerset and Yates, however most of it is private and there likely have been few efforts to survey for this species. The following audio example will be inaudible to most listeners due to the short, high pitched nature of the call: Station 6 (May 12, 2016). The spectrogram below shows the distinctive characteristics of Henslow's Sparrow nocturnal flight call - one of highest-pitched flight calls of North American passerines, descending in pitch, with relatively broad modulations distinctively indented at their peak, in this cases with a modulation rate above 150 cycles per second. This species appears to have been extirpated in Ontario north of western NY, so there is a possibility this individual is from the remaining NY population. 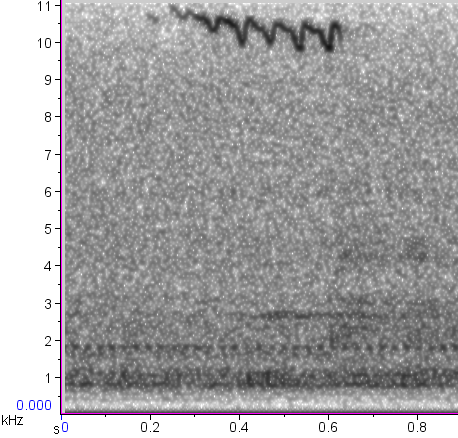 Henslow's Sparrow nocturnal flight call recorded at ~12:45AM on May 12 over Station 6. The 1980-1985 New York State Breeding Bird Atlas includes one sighting from northern Yates. The 2000-2005 Atlas showed widespread decline across NY and only a few records in all of western NY. There are very few eBird records in western NY and none in the past 20 years. This species is currently listed as a High Priority Species of Greatest Conservation Need in NY. The 2016 nocturnal flight call study recorded a single Barn Owl flying over Station 5 at 12:45AM on April 20. Audio: Station 5 (Apr 20, 2016).